This is the Continuous configuration of the Non-Hazardous Waste Manifest form. It is for use with computer (dot-matrix) printers. They have the same print positions as the EPA 6-part Uniform Hazardous Waste Manifest Form 8700-22 (Rev. 3-05), EPA Uniform Hazardous Waste Manifest Continuation Sheet Form 8700-22A (Rev. 3-05) and the new 5-part Uniform Hazardous Waste Manifest Form 8700-22 (Rev. 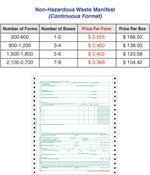 12-17), EPA Uniform Hazardous Waste Manifest Continuation Sheet Form 8700-22A (Rev. 12-17). This allows you to use the same software to print both your hazardous and non-hazardous shipments. 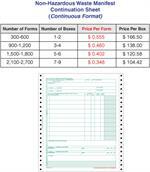 It is sold in cartons of 300 forms.